In the old dairy of your family farm the feeling of a hundred, watchful little eyes prickles your neck. You begin churning the milk. In an attempt to show them you mean business after the sheep stealing fiasco, and to gage their repentance, you declare to the farm-y air that the pails and woodbox need filling (these being a couple of your dismal chores). After a blink and a faint whooshwhoosh buckets filled with cold water slosh into row and logs clatter a tower in the box. Impressed but not deterred you demand the return of the stolen sheep. A bleating in the paddock demands a look and when you return to the dairy there are several perfect pats of pale-gold butter on the work table, each topped with a sprig of fresh parsley. You are impressed again–with the little blue men, as well as with yourself. Being the new "hag o' the hills" might not be so bad, even if you are only nine. 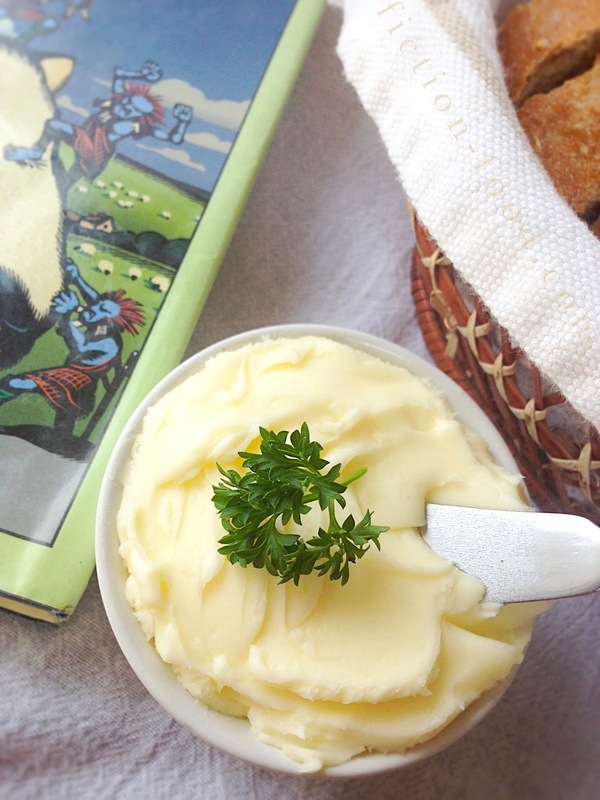 "When she got back, the butter had been churned. Not just churned, in fact, but patted into a dozen fat golden oblongs on the marble she used when she did it. There was even a sprig of parsley on each one." –Chapter 3, The Wee Free Men by Terry Pratchett. The Wee Free Men (pub. 2003) is one of the many novels in British author Terry Patchett's fantasy-comedy Discworld series, and one of the few of the series aimed at younger readers. There are three more books that follow the adventures of young witch Tiffany Aching, with more antics of the tiny but fearsome Nac Mac Feegle (the Wee Free Men) pictsies. 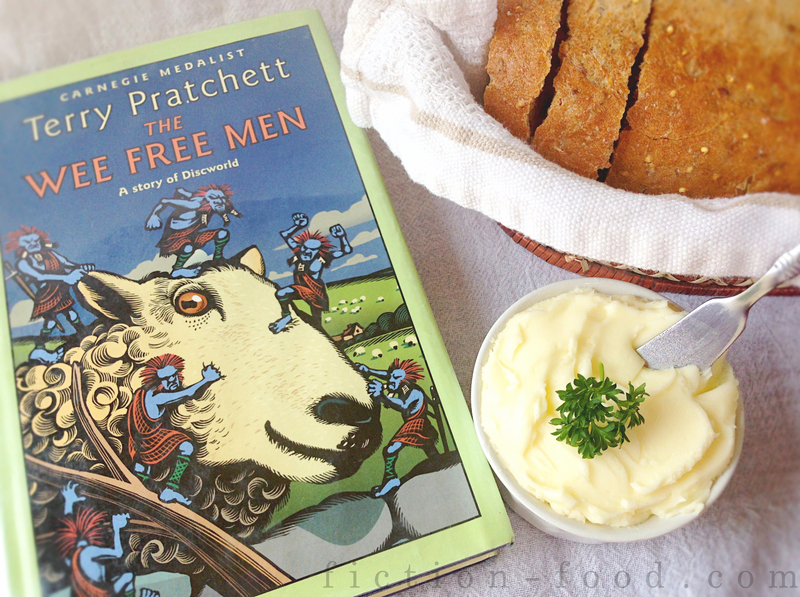 So far I've only read The Wee Free Men from Pratchett but the rest of the Tiffany books are on my List because I enjoyed the first one so much. If you like fantasy that pokes fun of its genre, youth books with a clever, no nonsense lead, and the running amok of wild, drinking wee folk, then give this a try. She paused, put the paddles down, and with the tip of a very clean finger drew a curved line int he surface, with another curved line just toughing it, so together they looked like a wave. She traced a third, flat curve under it, which was the Chalk. She stamped it onto the butter and took it off carefully. There, glistening on the oily rich yellow surface, was a gibbous moon and, sailing in front of the moon, a witch on a broomstick." –Chapter 14, The Wee Free Men by Terry Pratchett. Note: With her fingernail Tiffany draws a three line image of water over land, or Land Under Water; the meaning of her name and the past of the Chalk, her home. It's unclear what the image looked like exactly, but you get the idea (I made two versions. To me, one looks like a pleased, sleeping face). With a handmade wooden butter stamp she imprints an image of a witch riding a broomstick in front of a gibbous (not quite full) moon. The photos in this post show my interpretation of that (reminiscent of the cake from "Kiki's Delivery Service") but again, you can totally recreate it how you see fit! 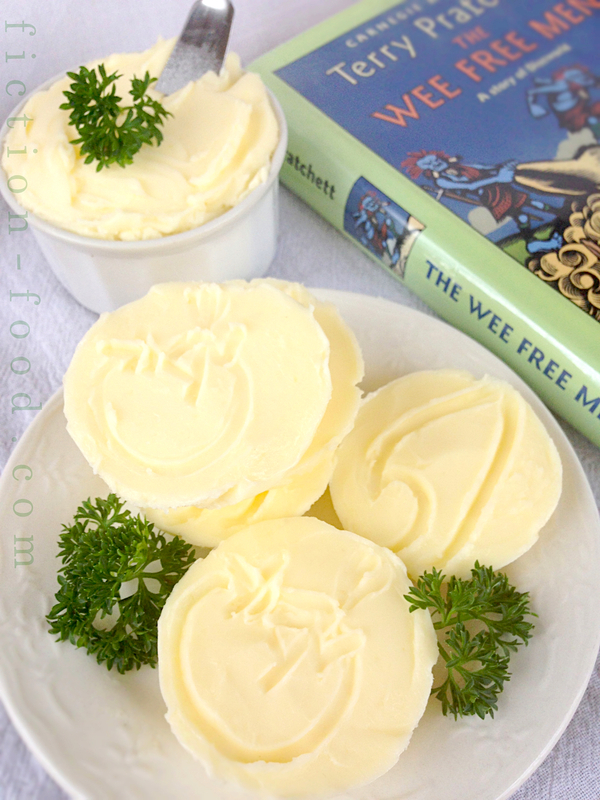 Instead of using fingernails and in lieu of a butter stamp I suggest using a chopstick to draw the images on the butter. "Then she made cheese..." (chap. 14, The Wee Free Men). Tiffany also makes cheese and you can too! 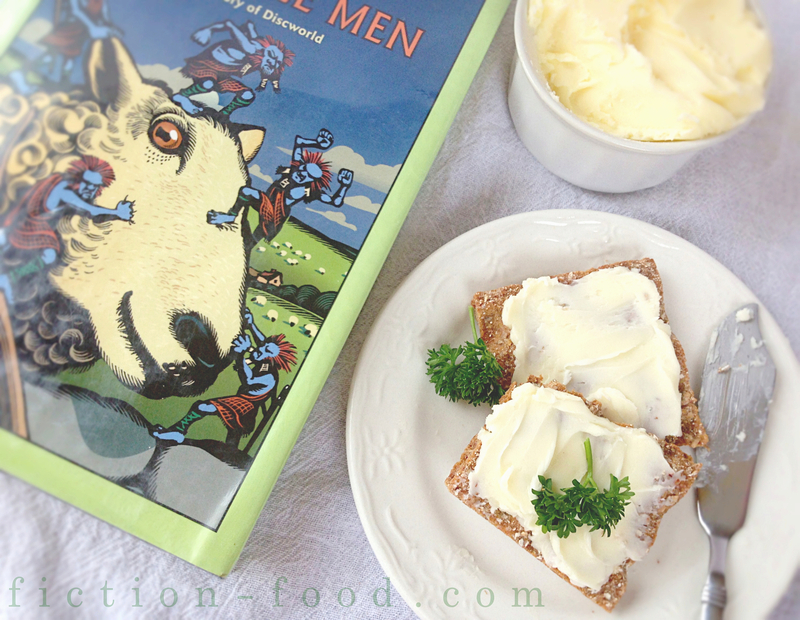 Click here for my Prim's goat cheese recipe (like this butter, it's also pretty easy to make). 1. Pour the heavy whipping cream into the chilled mixing bowl (Kitchen Aide mixer is so convenient for this) & mix on low-medium speed until the cream begins to thicken. Place a large sheet of plastic wrap over the mixer (to prevent spattering) & turn speed to high. The heavy cream will go through a process of becoming whipped cream & then separate & become butter solids & butter milk. This will take about 15 minutes total. Pour the buttermilk into a cup & save for other recipes (like these buttermilk pancakes! You'll need more though) or drink it up on the spot. 3. If you'd like to flavor the butter with a pinch of salt &/or other seasonings, do so now by pressing it into the butter with the spatula until it's evenly worked in (the butter is also very nice plain–that's how I left mine). 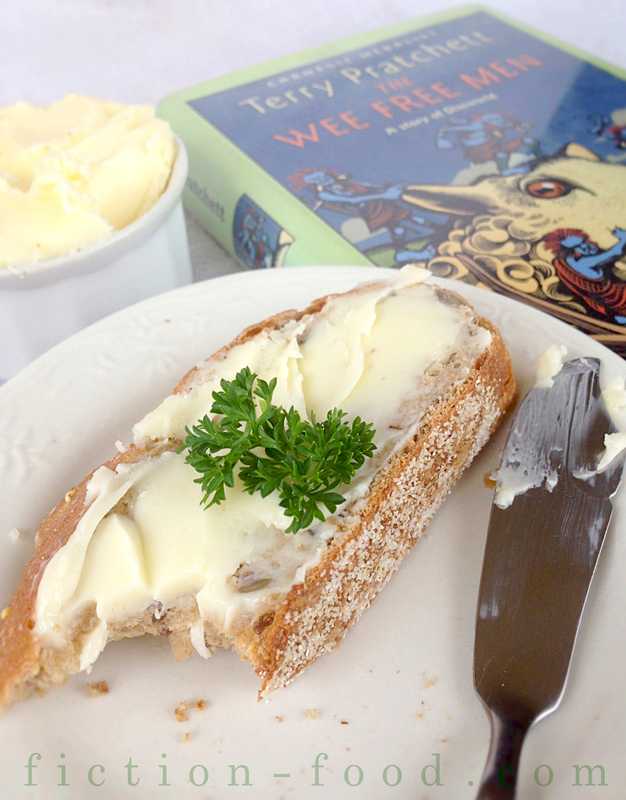 Scoop the butter into a ramekin or two & place in the fridge or use some right away. If you'd like to make little patties, cut a few squares of parchment paper (about 5 or 6) & push them down into the cups of a muffin tin. Spoon the butter into the parchment-lined cups, about 1/2" high each. You can also simply form patties (rounds or oblongs) using a spatula or two & then sit the patties on parchment. If you'd like to draw pictures on the patties, do so at this point with a chopstick. Place the patties in the fridge for a few hours so they can solidify. Use in cooking or serve on special bread or crackers. 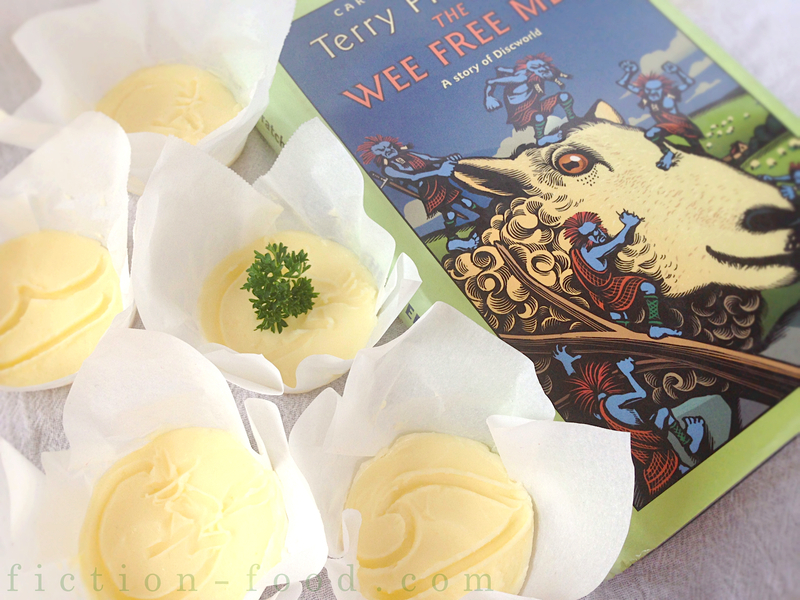 Fresh parsley really makes a great pairing–the Nac Mac Feegle knew what they were doing! If you'd like to gift some of the patties simply wrap in parchment & secure with a little string.